Gurukul Kangri University P.G Diploma and B.Tech Repeat 1st Year Exams 2013 Results declared: -The Gurukul Kangri University is one of the Famous and leading Universities of Uttarakhand state. The University is situated in the Haridwar Uttarakhand. And every year many of students are studied from this University. The Gurukul Kangri University Offered various Degree, Diploma and Certificate courses to students. So as now the University has declared the results of P.G Diploma and B.Tech Repeat 1st Year Examinations 2013. And now all the students of given subjects who are waiting for their results can easily check their results online. The results are available in the official website of the Gurukul Kangri University Haridwar. You might also like: - Gurukul Kangri University B.Sc and B.Pharma 1st Year results 2014. So below I am giving you some links of results and you can easily get your results of PG Diploma and B.Tech 1st Year Exams 2013 from below given links. So just click on below given links and then you will be able to get your results online from here. Click here for PG Diploma 1st Year Exams 2013 Results of Gurukul Kangri University. 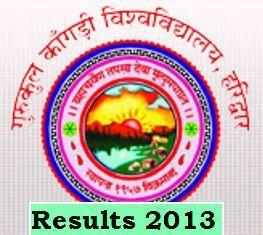 Click here for B.Tech Repeat 1st Year Exams 2013 Results of Gurukul Kangri University. You can also visit the official website of Gurukul Kangri University for more details and information about results. The website of University is www.gkv.ac.in.